The Provincial Pathway is a series which will follow a select number of FHBC athletes on their journey from the Regional Program through to the National Championships. If you got a chance to watch any of the Girls Train 2 Compete Regional Tournament last weekend, you probably noticed the Southeast Killer Whales sweeper, Saneh Basra. As a natural midfielder playing back on defence for the tournament, Basra’s powerful hits, exceptional ball control and bursts of speed up the field made her a stand out player in the tournament and a clear selection for the U18 BC Girls Rams. 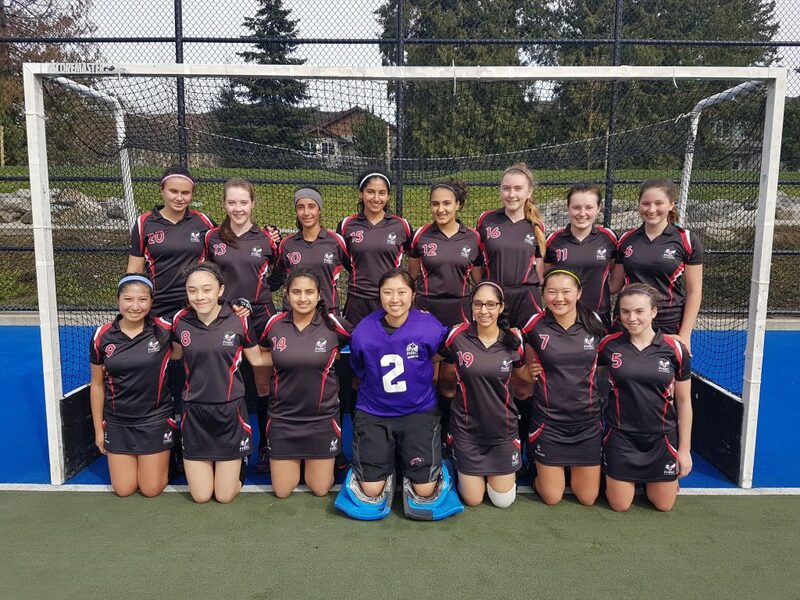 Basra’s talent has not gone unnoticed this year, as the 16 year old Surrey native was selected to the Canadian Women’s U21 Junior Development Squad. She went on her first training tour with them in Chula Vista, California back in February. Basra – bottom right – with the Canadian Junior Development Squad on tour in Chula Vista, California. Photo by Field Hockey Canada. Basra got involved in field hockey when her dad introduced her to the sport ten years ago. She’s played her club hockey with the Surrey Panthers ever since, and is currently in her third year playing with the Field Hockey BC Regional Program. She first joined the program in grade seven, but took a couple years off to focus on track. Last year, she decided to make field hockey her priority, so she returned to the Regional Program and now uses track as cross-training to help with her fitness. She’s been highly successful in the program ever since, as a part of the U18 BC Rams who won the silver medal at the 2017 National Championships. Basra – back row third from left – with her Train 2 Compete Regional team, the Southeast Killer Whales. The team placed fourth in the tournament. Photo by Alicia Pereira. Currently in her grade 11 year, Basra hopes to study and play field hockey at the college level after graduation. She also has aspirations to make the Canadian National Team and play for Team Canada in the Olympics one day. As a step in this direction, she has been invited by Team Canada’s head coach to attend a training camp with them this summer, which will be her first official camp with the Senior National Team. In the meantime, Basra is setting her focus on improving as a team and as a player with the Provincial Program. With her skill set and determination, we can’t wait to follow Basra’s progress through this Provincial season and the years to come! Posted in About, Clubs, NEWS, Players, Tournaments, Uncategorized.